You are currently browsing the category archive for the ‘Growing successful online communities’ category. Connie Bensen posted a great presentation on SlideShare a few weeks ago that I must share here. Five steps for establishing metrics for a successful online community. I like that she stresses the importance of identifying business objectives and priorities first, because without a clear idea of what you’d like to gain, what good is measurement? This is often the missing link in many cases when it should really be the first step. Enjoy. View more OpenOffice presentations from Connie Bensen. I think the work that goes into fostering community and building relationships online is grossly underestimated. It takes an enormous amount of work. You have to have personality, tact, an amazingly thick skin and a work ethic that will not quit. You also have to genuinely like communicating with people. Let me repeat that: You have to genuinely like communicating with people. All types of people. Even people you would likely detest if you were to meet them in person. You must learn to trust your gut and make tough decisions even when you know they will cause an uprising. And when that uprising happens, you have to know how to deal with it, manage tempers and steer the ship back on track. What’s most important in all of this, is you have to do it every day. Yesterday’s work means nothing tomorrow. If you can’t communicate on a micro-level, then you can’t grow a successful online community. I learned all of this by being in the trenches and growing a community from zero members. It was trial and error. And 21 months later, it still is. Some days are very frustrating. I certainly know a lot more than I did at the beginning and I’m pretty good at engaging the masses, but I am not as good as I will be in another year, or even another month. I wanted to make this known. Everyone is talking about the importance of building community. If you want to do it right, it has to be more than lip service. I wanted that to be known. That’s why I wrote a book about growing online communities. It is with much pomp and circumstance that I announce the launch of my new website, GrowingSuccessfulOnlineCommunities.com. 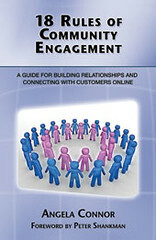 It will serve as home base for my book, 18 Rules of Community Engagement: A guide to building relationships and connecting with customers online set to publish in late May or early June. I have to give major kudos to Phyllis Zimbler Miller and Yael Miller, the dynamic duo behind Miller Mosaic. They conceptualized and designed the website and treated my like an A-list client. If you have a book to market, you need them in your life. Period. And if you haven’t ordered your copy today, please consider it. Thanks to every reader of this blog for your support and I look forward to our continued relationship.